Must have current Lifeguarding Certification or Lifeguarding Certification not expired longer than 30 days. Pocket Face Mask Combo set (Adult and Pediatric)-Will be supplied to you for Lifeguarding Classes. *For Lifeguarding Review classes you need to bring your own or purchase a brand new one for $12.00 on site when you arrive. Copy of the Lifeguarding manual (link is on this e-mail) either on ipad, computer or printed version. *If signing up for the additional module of Waterfront Skills, please bring, in addition to the above, a Mask and Fins set. Snorkel not required. Swim 550 yards, continuously demonstrating breath control and rhythmic breathing. Candidates may swim using the front crawl, breaststroke or a combination of both, but swimming on the back or side is not allowed. 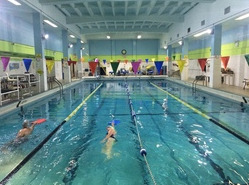 Swim goggles may be used.Swim 5 yards, submerge and retrieve three dive rings placed 5 yards apart in 4 to 7 feet of water, resurface and continue to swim another 5 yards to complete the skill sequence.Tread water for 2 minutes, using only the legs. Candidates should place their hands under the armpits. Complete a timed event within 1 minute and 40 seconds. Starting in the water, swim 20 yards. The face may be in or out of the water. Swim goggles are not allowed. Surface dive, feet-first or headfirst, to a depth of 7 to 10 feet to retrieve a 10-pound object. Return to the surface and swim 20 yards on the back to return to the starting point with both hands holding the object. Pocket Face Mask Combo set (Adult and Pediatric)-Will be supplied to you for Lifeguarding Classes. *For LifeguardingReview classes you need to bring your own or purchase a brand new one for $12.00 on site when you arrive. Prerequisites: Minimum age: 15 years. Swim front crawl or breaststroke for 300 yards continuously demonstrating breath control and rhythmic breathing. Tread water for 2 minutes using only the legs, placing hands under armpits. Complete a timed event within 1 minute, 40 seconds. o Starting in the water, swim 20 yards. o Surface dive to a depth of 7 to 10 feet to retrieve a 10-pound object. o Return to the surface and swim 20 yards on the back to return to the starting point. o Exit the water without using a ladder or steps. Lifeguard Jobs Available NOW!!!! Immediate job Placement possible at several partner Facilities for our Students! !-Work starts here!! Combo class including CPR/AED and first aid. As an athletic trainer or lifeguard, it is your duty to respond to cardiac or breathing emergencies until more advanced medical personnel can take over. From assessing needs and making decisions to providing care, this program provides the skills you need through discussion, video and hands-on training based on real-life rescue scenarios. The recommended age for this course is 11-15 years old. As an EMT, Nurse (RN), firefighter, athletic trainer or lifeguard, it is your duty to respond to cardiac or breathing emergencies until more advanced medical personnel can take over. Basic Life Support for Healthcare Providers (BLS) is designed to train professionals to respond to cardiac and breathing emergencies for adult, child, and infant victims. Consistent with the 2015 AHA Guidelines for CPR/ECC, BLS is the foundational CPR/AED program typically required for healthcare providers and public safety professionals. Through the use of lecture, skills demonstration and practice, case-based emergency response scenarios, and reflection and debriefing activities with a focus on team-based response, BLS builds the key critical thinking, problem solving, and team dynamic skills that are needed to drive better patient outcomes. Each participant will receive a complimentary pocket mask set to use during the skills sessions.